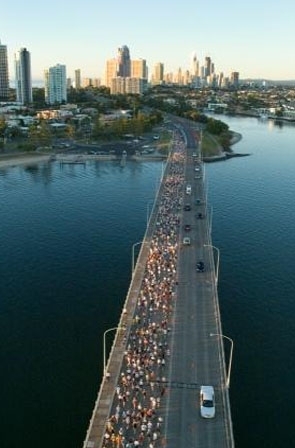 BookToday has a wide range of accommodation close to the annual Gold Coast Airport Marathon. Embrace the next step towards the 2010 Gold Coast Airport Marathon being held in one of the most desirable holiday destinations in the world on 3rd and 4th July 2010. Staged annually on the first weekend in July, the 32nd Gold Coast Airport Marathon is set to motivate and challenge more than 23,000 people of all ages and abilities. There will be a Marathon, a Half Marathon, a 10km Run, a 5km Challenge and Junior Dash races over 4km and 2km for the kids. Runners crave the magnificent running conditions on the Gold Coast in winter, as well as the flat, fast and beautiful course that runs alongside the Pacific Ocean surf beaches and broadwater.